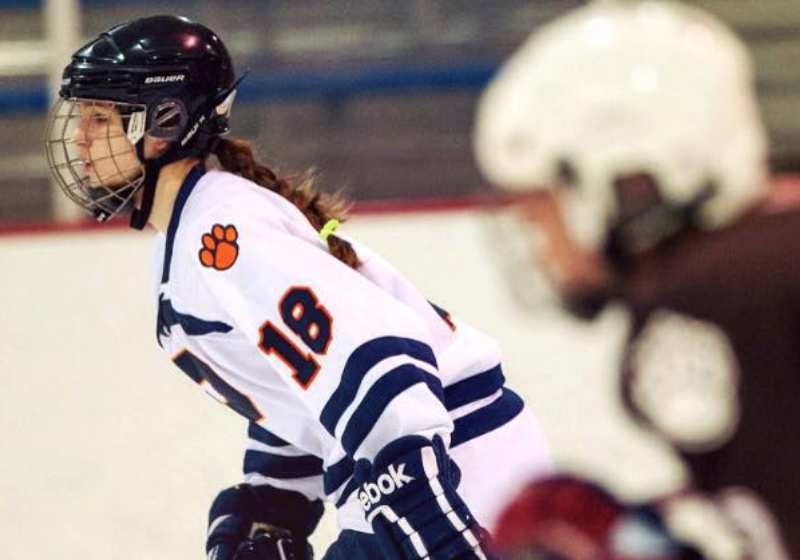 Despite playing a sport dominated by the opposite gender, sophomore Anna Bidstrup has carved a striking path through ice hockey: She’s the sole female member of the UR Men’s Club Hockey team this year. After the collapse of the women’s team, the longtime player was finally granted permission to join the men after being denied a spot on the roster last season. From her earliest exposure, to her most recent endeavors in the sport, Bidstrup has always been outnumbered (and outsized) by her male counterparts. At the age of seven, the D.C. native was attracted to the sport’s fast-paced and competitive nature. She expressed interest in playing alongside two of her friends, whose mother played Division I hockey for St. Lawrence University and would coach the girls for the majority of their career. “I never saw a girl play hockey before I started playing,” Bidstrup said. She would continue to play all the way into ninth grade, when she joined the boy’s team at her high school and picked up a new sport: field hockey. Upon the discovery that she was a natural at it, she decided to focus on pursuing a potential college field hockey career. Unfortunately, her advances in Division I recruiting would come to an abrupt halt due to a labral tear of her hip, an injury sustained in her junior year of high school. As the injury improved, she began to consider playing Division III field hockey in college, drawn to it by its more “relaxed” nature in comparison to the commitments associated with Division I. She worried, though, about sports controlling her college life, and so decided to give up varsity sports and take up club athletics. At the start of her sophomore year at UR, Bidstrup began playing with the men’s hockey team. Bidstrup cites her size disadvantage as the biggest challenge she faces in a male sport. While it is possible for men to be unpenalized for a career-ending hit to an opponent, women’s hockey remains a non-contact sport. Despite these challenges, Bidstrup’s love of the sport has prevailed. To her surprise, Bidstrup’s teammates have told her that they enjoy watching women’s college hockey due to the sharper, more fined-tuned skills of its players. It would seem that others would agree, with the recent establishment of the National Women’s Ice Hockey League last March. “When it happened last year, I was like, ‘this is huge, this is a big step,” she said. She admits, however, that there is room for improvement due to a lack of interest outside of the sports community, and the general population’s unawareness of the significant milestone. She also feels the recent improvements in safety regulations, as a whole, are up to par. This passion for growing the game has led Bidstrup to pursue coaching, allowing her to encourage young girls to take up the sport that changed her for the better. While some would be hesitant to put their daughters in a sport seen as being plagued by violence and size disparity, she never fails to see its merit. Bidstrup, a public health and economics major, plans to become involved in health policy and says she could potentially see her love for hockey and health intersecting in the future, particularly with concussion education and prevention. Sports Editor Jackie Powell contributed reporting to this piece.